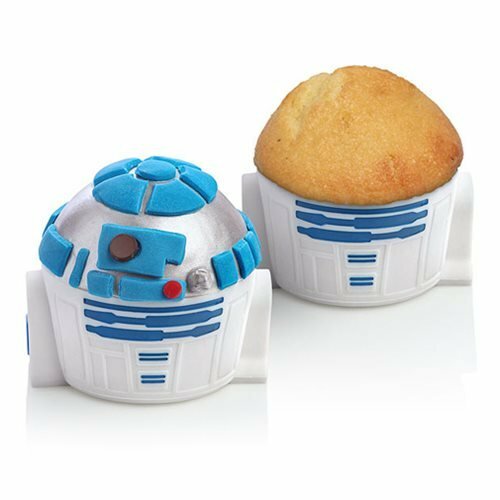 Create your own droid with this Star Wars R2-D2 Baking Cups! Whip up your favorite recipe, pour it in, and bake. Decorate your favorite little astromech the way you like or have a party and your guests can decorate each cupcake. Have fun and create endless sweet goodies with these Star Wars R2-D2 Baking Cups! These are made from BPA-free, food grade silicone and measure about 3-inch in diameter and 1 3/4-inch tall. Dishwasher, microwave, freezer, and oven safe. Ages 13 and up.